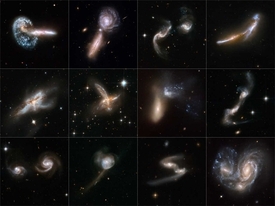 STScI-2008-16 - Astronomy textbooks typically present galaxies as staid, solitary, and majestic island worlds of glittering stars. But galaxies have a dynamical side. They have close encounters that sometimes end in grand mergers and overflowing sites of new star birth as the colliding galaxies morph into wondrous new shapes. Today, in celebration of the Hubble Space Telescope's 18th launch anniversary, 59 views of colliding galaxies constitute the largest collection of Hubble images ever released to the public. This new Hubble atlas dramatically illustrates how galaxy collisions produce a remarkable variety of intricate structures in never-before-seen detail.